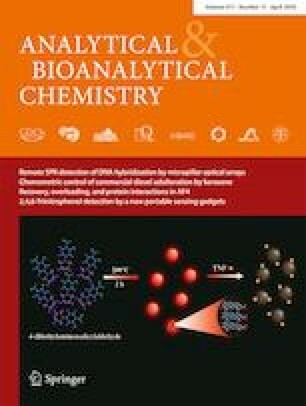 An optical sensing gadget using fluorescence of carbon dots (CDs) was developed to realize the in-field detection of 2,4,6-trinitrophenol (TNP) in tap water and lake water samples. Fluorescent CDs were prepared through a one-step hydrothermal synthetic route. The fluorescence spectra demonstrated that the CDs could specifically discriminate TNP from other nitroaromatic explosives in an aqueous medium. The fluorescence of the CDs was quenched linearly with the concentration of TNP in the range from 1 to 100 μM, with a detection limit of 0.48 μM (3σ/k). The detection mechanism was ascribed to the synergistic effect of the inner filter effect and electron transfer. In addition, a portable sensing gadget based on a high-precision RGB color sensor and a micro control unit was developed. With use of the sensing gadget and the CDs, TNP detection in tap water and lake water samples was realized. Importantly, the portable sensing gadget combined with highly stable, low-toxicity, and sensitive CDs might have great potential for application in extensive in-field sensing situations. The online version of this article ( https://doi.org/10.1007/s00216-019-01670-z) contains supplementary material, which is available to authorized users. This study was supported by the National Natural Science Foundation of China (grant no. 21535006, grant no. 61801400, and grant no. 61703348), the Fundamental Research Funds for the Central Universities (grant no. XDJK2018C021, and Japan Society for the Promotion of Science KAKENHI (grant no. JP18F18392).